It’s no joke: You can golf year-round in Southern Idaho. When other parts of the state are blanketed in snow, Southern Idaho still has plenty of options for folks who want to hit the links. Of course, the greens are even more spectacular in summer! Southern Idaho’s golfing options range from historic public courses to luxe options in the Snake River Canyon. If traditional golfing isn’t your thing, check out the disc golf options available or hit the putt-putt greens. Clear Lake Country Club. Founded in 1929, this venerable Buhl course isn’t just home to great golf — you can also fly-fish year round in the club’s lake! Clear Lake is spread out over rolling terrain and features beautiful views from its vantage point in the upper Hagerman Valley. Take your RV and make a weekend of it — the club offers full hookups for overnight visitors. Holes: 18, plus a driving range, chipping and putting greens, and a 15-acre lake for fly fishing. | Greens fees: $6-$26 weekdays, $6-$30 weekends. River’s Edge Golf Club. This municipal course in Burley features 18 holes and is located on the Snake River, offering beautiful views and affordable rates. Private instruction with a PGA pro is just $45. Holes: 18 | Greens fees: $9-$23 weekdays, $9-$28 weekends. Canyon Springs Golf Course. Nestled in the spectacular Snake River Canyon in Twin Falls, Canyon Springs Golf Course was originally part of the estate of I.B. Perrine (the famous bridge that spans the canyon and overlooks the course bears his name). Opened in 1973 with nine holes, this 18-hole beauty is now one of the most popular places to tee up in Southern Idaho. Enjoy amazing views from inside the canyon, where the weather is a bit warmer — it’s not unusual for Canyon Springs to open for walking-only golf as early as February. Holes: 18, plus a driving range | Greens fees: $17-$30 weekdays, $20-$38 weekends. Discounted spring, fall, and winter rates available. Jerome Country Club. The Jerome Country Club is among the oldest in Southern Idaho. Founded in 1926, this club’s greens were originally “mowed” by grazing sheep. The club is private, but the public is welcome to play or have a bite to eat at the Caddy Shack Restaurant. Holes: 18 | Greens fees: $25 weekdays and $30 weekends with a member; $35 weekdays and $37.50 weekends without a member. Junior golfers pay $15 weekdays and weekends, with or without a member. At more than 7,000 yards, the 93 Golf Ranch is the longest 18-hole golf course in Southern Idaho, with play beginning as early as March and lasting through December, making it a perfect destination for hard-hitting golf lovers. Open for both public and membership play, this golf course spans 180 acres. Gooding may have fewer than 4,000 people, but its residents are big supporters of their local golf club. The Gooding Country Club earns raves for its incredibly friendly staff and affordable prices, as well for its great bar and clubhouse. Holes: 18 | Greens fees: Call (208) 934-9977 for fee information. Built in 1931, this public course has hosted the Idaho Open nearly 10 times and boasts a driving range, putting green, chipping green, and an 18-hole course that offers challenges for everyone from beginners to pros. Take a lesson from the club’s PGA staff or grab a bite at the snack bar; whatever you choose, this family-friendly club will offer it with a smile. This course is fun for everyone, from little ones who are just starting out to golf lovers still looking for that elusive hole-in-one. This 18-hole course has beautiful views of the South Hills and doesn’t believe in weekend pricing. There are many disc golf courses to choose from in the Southern Idaho region. The 21-hole course at Lake Walcott State Park, with its stately cottonwood trees and nice lawn, is considered to be one of the best disc golf courses in the state of Idaho. The city of Twin Falls has two 18-hole courses, one at the College of Southern Idaho and one in Rock Creek Canyon. Magic Mountain and Pomerelle have 18-hole courses up in the mountains, and then Buhl, Hazelton, Rupert and Burley all have 9-hole courses. Additional courses can be found at Sawtooth Elementary School and O’Leary Middle School in Twin Falls and Candlelight Park in Jerome. Get a look at the geology and history of the Snake River Canyon up close during a tour on 1,000 Springs Boat Tours’ River Mist. Take a lunch or dinner cruise and see the crystal-clear blue waters of Blueheart Springs for yourself. Perfect for the family or for a romantic weekend getaway. On a hot summer day, kids — and kids at heart — will find all sorts of fun at Putters Mini Golf and Hawaiian Shaved Ice. Located on Canyon Crest Drive in Twin Falls, this course offers 19 whimsical holes. When you’re done, refresh yourself with a sweet, frozen shaved ice. 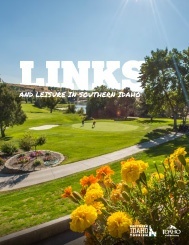 Savvy travelers know that Southern Idaho’s golf courses take leisure to the next level — and they’re all just an exit away from I-84! Get your guide to sweeping courses tucked into massive canyons, challenging riverside fairways, family-friendly favorites, and one of the strangest holes in the West. Late Fall Weather Is Perfect for Golf in Southern Idaho!